Donald Curtis meets his 15 youth at 9 a.m. for Saturday basketball. It’s an early start for most teenagers, but the outdoor court can get dicey later in the day. Aside from scattered glass shards, gangs stake claim to the blacktop as afternoon arrives. But basketball isn’t really what brings Curtis to the Washington, D.C., public housing community of Clay Terrace. He’s there for the youth—to encourage, educate, and empower them. Curtis runs the nonprofit Student-Athletes Organized to Understand Leadership, or SOUL, which uses athletics as a gateway to academic and professional development for at-risk boys and young men. He also serves as programs and operations coordinator in AU’s Center for Community Engagement & Service. While it has yet to reach its first birthday, SOUL has gathered serious momentum and backing. The program currently meets on Saturdays during the year, building toward a full-time summer camp. 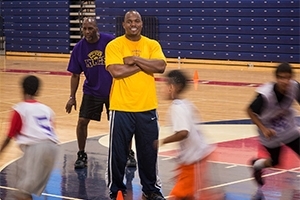 There, the youth receive literacy instruction from a local D.C. professor, professional development, and basketball coaching from private trainer Shawn Samuels, whose clients have gone on to play at Duke and the University of Kentucky, among other places. Needless to say, it’s a holistic approach to youth development. One of Curtis’ biggest disappointments fueled the birth of SOUL, now perhaps his greatest success. Seven years ago, he co-founded a Northern Virginia basketball program called the Alexandria Kings. A graduating high school senior from the Kings landed a basketball scholarship to Wells College in New York, where he could also take classes at nearby Ithaca College. Donald was thrilled. But after just a year, the student—lacking a solid academic base—flunked out. While he still continues with the Kings, his attention has shifted to address that missing academic piece through SOUL. Curtis is planning well ahead for his youth, some of whom have experienced time in juvenile detention facilities. He’s collaborating with companies to create career day visits and even internship opportunities at local offices. And companies are already buying into the idea, literally. On Saturday, April 5, SOUL is hosting its Inaugural Corporate Basketball Challenge, which will take place at D.C.’s Verizon Center—home of the NBA’s Washington Wizards. After raising funds toward an entry fee, company teams ranging from PricewaterhouseCoopers and Evolent Health to the Advisory Board Company and the Royal Bank of Canada will compete against one another in a tournament. The raised funds will help SOUL strengthen its summer program and resources. Plus, the Verizon Center was an obvious choice for a venue; last year the Wizards honored Curtis for his community assistance before naming him February’s coach of the month. For Marcy Campos, director of AU’s Center for Community Engagement & Service, Curtis’ successes with SOUL are an extension of the work he does for the university. He’s taken those skills gained in planning AU’s MLK Day of Service and trained them on a specific population. That leadership quality has established solid on-campus support, as AU students have used the university’s Community Service-Learning Program to intern with SOUL for course credit. As a result, Curtis views his organization as not just beneficial to his at-risk youth; he also believes it provides AU students the type of unique opportunity that the university is known for. “If a business student works with me, they have the opportunity to work with CEOs of large organizations, a lot of individuals who can actually put them in jobs,” he said. Still, his efforts really come back to supporting an at-risk community. In fact, it’s a neighboring community to where he grew up and where basketball pointed him toward college. Once a teen who played on a glass-strewn court similar to that of Clay Terrace, Curtis hopes to pass on the same motivation he received from his high school basketball team. “Somebody helped me in this way. Somebody pushed me to do a little bit more. They used sports as a mechanism to get me there,” he said.